Not many F﻿﻿﻿rench Presses have managed to look like it has a long history dating back to the 1920’s - but the Madrid does. It is also one of the many things that sets this French Press apart. Thanks to its unique, Chrome housing, it can blend in perfectly with any kitchen decor. It has a solid stand as well. This helps to hold the glass carafe together, even when it’s filled with coffee. If you’ve been turning the internet inside out for a French Press that lasts, then do stop your hunt right here. The manufacturers have taken great care to ensure the use of high-grade materials in construction. Apart from the heat-resistance and thick borosilicate glass, both the housing and the filters are made up of chrome. Which also means that no plastic has been used. Plastic in filters could be a pain to handle, and bad to the health. But the chrome filters of Madrid are very sturdy and they do a wonderful job at filtering. When you press the plunger down, they’ll set to work without any wobbly-complaints. The glass carafe, however, is breakable under improper use. So avoid pouring pipping hot water into it and also washing it when it is still warm. The best part about this carafe is that it can retain heat much longer than a typical glass carafe. You can enjoy a warm cup even after a considerable time lag. Madrid lacks nothing when it comes to its primary function. It takes its own time to brew, but manages to capture the unique flavours of coffee even better than a barista would. The finely made mesh filters do an excellent job at filtering out sediments. There’s also another filter at the spout, which strains out any escaped particle when you pour the coffee to your mug. This way, you can taste your cup to the last drop - without having to battle with the grounds at the bottom. As we always say, make sure the coffee beans you use are of good quality. French Presses can’t create miracles. They only brew what they’re given. Also: Avoid using finer grounds. They often find their way through the filters no matter how well they’re made. You can adjust the coarseness of the grounds after observing the French Press for a few days. The manufacturers were so focused on the stability of this French Press that they nearly forgot to make it easy for cleaning. It’s not that you can’t use a dishwasher, or have it cleaned with a quite simple rinse. But it could be a tad difficult to unscrew the beaker from the frame. This must be because of the rubber ends used to hold the beaker firmly in place. You need to tug at it a few times, then whoosh - it’ll come off. However, it’ll smoothen out over time and volunteer to come off quickly when it is time for a rinse! 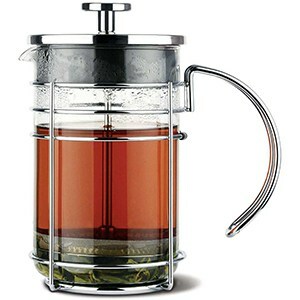 If you’re on the market for a French Press with a glass carafe, then Madrid is an excellent choice to consider buying. It has the quality to go with its looks, and tastes to satisfy your taste buds. Anyone can try it out - but make sure you buy the right size. The 34-ounce or 1 litre carafe is advertised to make 8 cups. But in reality, it won’t suffice more than 4 average cups. Unless of course you pour 4 ounces into one cup. So be aware of it before you place a buy. Also keep in mind that this isn’t the ideal French Press to carry with you to work every morning. It’s more suitable to be placed in a safe corner of your kitchen, and used everyday with supreme care. Not all French Presses have the amazing finish Madrid has. Nor can they all make coffee taste so good and feel so hot. The price is also set right - making it quite affordable than not. That’s why we hold nothing back in recommending it to you.